Communemedia +: What was Rexism? The danger in supporting Belgicistic nationalism is bigger than many people in and outside of Belgium think it is. Ultranationalism of this kind was present in the once electorally very succesful Rexist movement. In the thirties, the party Rex could easily get ten or twenty percent of the votes in Belgium. It was a time when more and more people started to embrace very dubious forms of nationalism, also Social-democratic leaders like the Belgian Hendrik de Man (who began to sympathize with Nazism) and Bolsjevist leaders like Joseph Stalin. Rexism was a fascist movement in the first half of the twentieth century in Belgium. 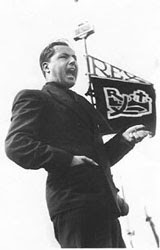 The Rexist Party (Parti Rexiste), officially called Christus Rex, was founded by Léon Degrelle (picture). The name was derived from the Roman Catholic social teachings concerning Christus Rex, and it was also the title of a conservative Catholic journal led by Degrelle. Rexism was mostly about Belgicistic ultranationalism. Early Rexism called for the “moral renewal” of Belgian society in large conformity with the teachings of the Church and other ultra-right parties, by forming a corporatist society and abolishing parlementiary democracy. Rexism soon began to ally itself with the interests of Nazi Germany.